I’m hangin’ on here, chargin’ half a buck a cut. That new place next county over, the one that’s chargin’ two bucks for a razor cut, they’ve taken some of my business, but I got my loyal customers. They just want a good, honest trim and a good honest price. Don’t know where I’d be without them. I’m lucky enough to own my buildin’, so I don’t gotta worry about rent and all. And it’s just me, so I ain’t gotta pay any salary. But still, with maintenance an’ upkeep, it ain’t easy. But we all help each other out around here, as much as we can. That’s the nice thing about this town. Got a real sense of community here. Course most of us is just as hard up as the other. It’s been bad since the factory shut down. Lot of good people got thrown out of work, and it’s been a hard go of it since. But we’re proud. We take care of each other. I do what I can. Sometimes someone in town is a little hard up, I only charge two bits. Sometimes I don’t charge nothin’. It’s a little bit I can do, an’ it all comes out in the wash. Maybe one day I’m the one that’s a little hard up, an’ where would I be then? So it all evens out, an’ it makes me feel good and Christmas-like to be able to help a little. Lot of outsiders stop in while passing through, an’ that helps. Sometimes it’s suits, an’ you think maybe, just maybe, they might be talkin’ about opening up the factory again. Gee, that would be a big thing. Mostly it ain’t, though. Mostly just folks passing through. But again, I know all my neighbors, and we’ve got it nice ‘round here. It’s a good, nice community, an’ you just don’t get that in the big city. An’ I wouldn’t trade it. Times are hard, but we’re proud. We take care of each other. It is sad how the loss of a business can destroy a town. My parents live in a small town and a large part of the population work at an assembly line plant. A few years ago, there was talk of it moving. The plant ended up staying open, but it would have pretty much killed the town if it had closed. Yeah, it’s all numbers to the number crunchers. The human toll is a little more tangible. This is a great piece. What inspired this? Thanks, man! 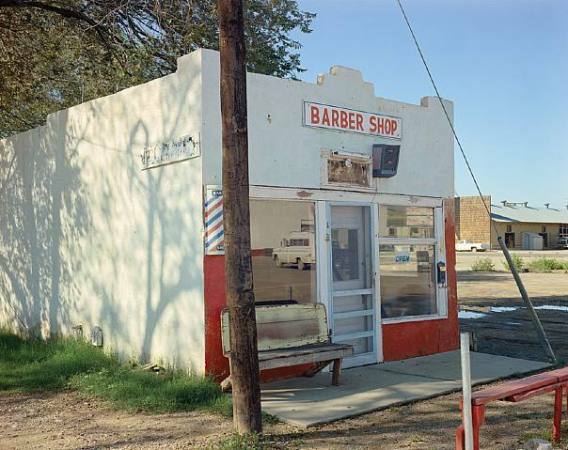 I looooove the work of Stephen Shore, and I went to his portfolio for inspiration last night, since I didn’t have anything coming to me. Saw this photo, and the piece kind of wrote itself in about 20 minutes. That’s that. I love those moments of perfect inspiration. Good job, Brian. In a good way, I hope. Seat of your pants week can be exciting or develop into hemorrhoids. I love your first line “Ain’t nothin’ here on the outskirts.” and how you go on to show that there IS still something special there. I think you captured the photo perfectly. My goal is always to capture the photo, Jeannette. Thank you so much for thinking I’ve done so. That means a lot. You really know how to express in words. You’ve beautifully captured the melancholia of a harsh reality. Really nice, Brian. Like sitting on a cracker’s front porch while he gently rocks back and forth in a worn, wooden rocking chair talking about the old days. Bread crumbs are a suitable replacement. Because… 😉 have a good week! Like the story built out of a picture. I love this! What a strong voice. I can just see him talking as he cuts the few hairs Ole Joe has on his head, stopping to ponder every now and again. I never thought of doing a vignette like that in a post, very interesting! I can’t wait to read your version!